Open the content area your instructor has specified (i.e. Assignments) so as to locate the assignment. Click on the assignment’s name so as to read the instructions provided and submit it. 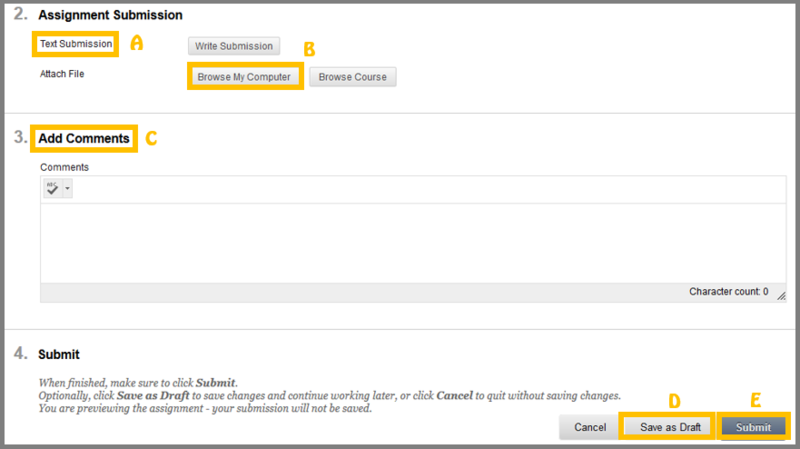 Click Write Submission (A) to expand the Assignment Submission box where you can type your response. You can use the content editor – VTBE to format text, add files, links, multimedia etc. 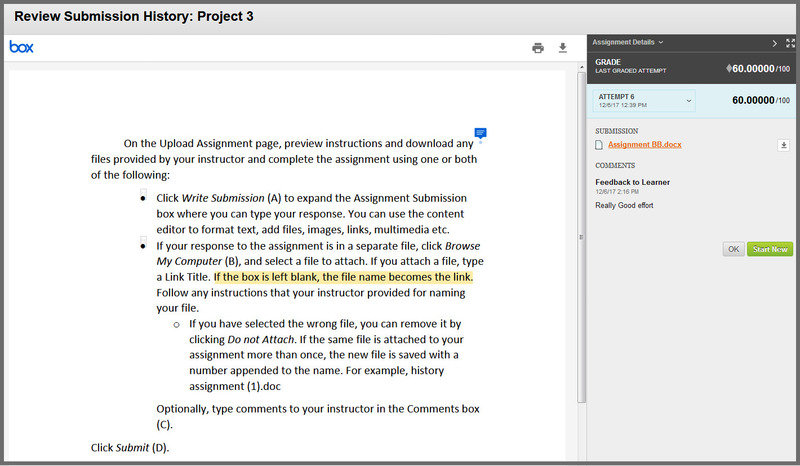 If your response to the assignment is in a separate file, click Browse My Computer (B), and select a file to attach and if possible type a Link Title. In case the field Link Title is left blank, the file name becomes the link. Follow any instructions that your instructor provided for naming your file. Optionally, type comments to your instructor in the Comments box (C). To temporary save your assignment but NOT send it to your instructor, click Save as draft (E). To send the assignment to your instructor, click Submit (D). A success message appears , confirming the assignment submission. For information on the use of VTBE , please click here. Use the Save as Draft function if you need to return to your assignment at a later time. This function saves your comments and files on the page. You can resume your work where you left off when you return. On the Upload Assignments page, click Save as Draft (E) to save your changes and continue working later. Return to your assignment and click the assignment link. On the Review Submission History page, click Continue Current Submission. On the Upload Assignment page, make your changes. Optionally, add comments in the Comments box. The Review Submission History page appears showing the information about your submitted assignment. There are various tools on the submission page(Viewbox) that you can use. A) Print: Allows you to print your project. B) Download: Allows you to Download your project. C) Collapse/Expand: Allows you to hide the Assignment details. D) Full View: Maximizes the view of the review assignment submission page. E) Attempts: Drop-down list that shows your submission attempts. F) Start New: Press the Start New button to start a new submission. G) Zoom: Allows you to zoom in and out of the preview of your project. 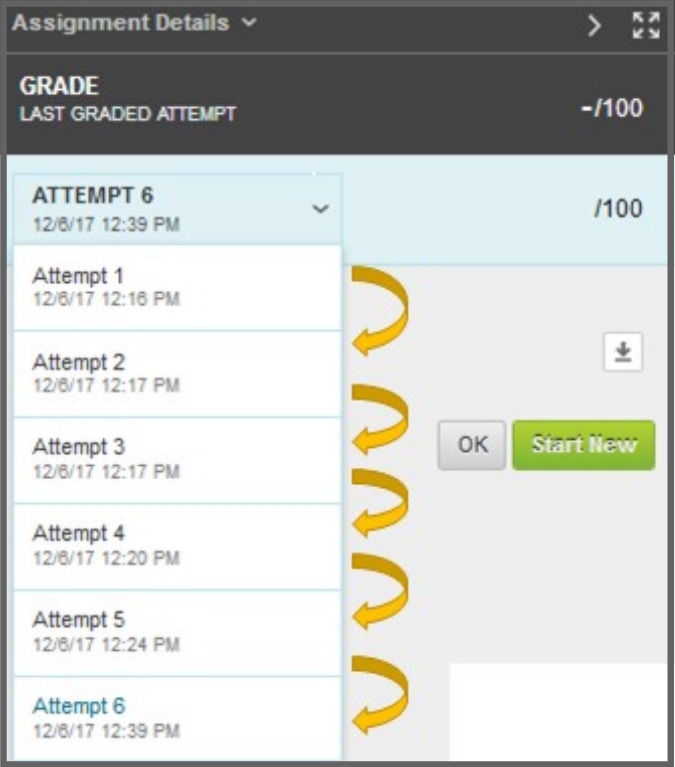 If your instructor has allowed you to submit an assignment more than once, you will see a Start New Submission function on the Review Submission History page. You access this page by clicking the assignment link in your course. On the Review Submission History page, view the details of your first submission. Click Start New Submission. On the Upload Assignment page, make your changes to the new submission. Optionally, in the Comments box, type your comments. Click Submit. You are returned to the Review Submission History page where your submission appears. View your past submission attempts by expanding the Attempt section. Click the assignment link to redirect to the Review Submission History page. Once you enter the page, you will see in the left part of the screen the document you submitted and the comments from the instructor. On the right part of the screen you will see your grade for this assignment and feedback from your instructor. Once you finish, click Ok. ATTENTION: You can not print the annotated document. You can only print your original submitted assignment. 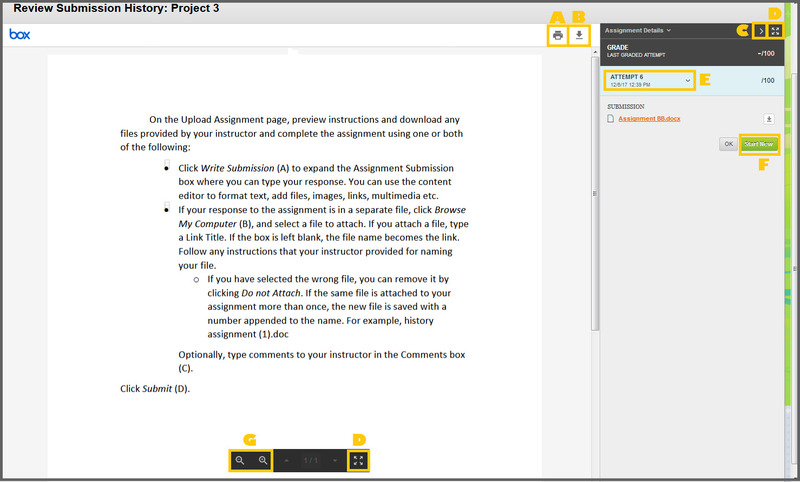 You can also view the annotations on your submitted assignment ONLY after your instructor has assigned grades. upload over 100 different file types. To see the file types that Viewbox supports press here.